Fresh lemons, oregano and garlic lend a Greek note to this flavorful grilled turkey. Combine oil, the juice of 2 of the lemons, onions, 1 tablespoon chopped oregano, 2 cloves of the garlic and pepper in blender or food processor container; cover. Blend until smooth. Pour into small bowl; set aside. Spray cold grate of outdoor grill with cooking spray. Prepare grill for medium indirect heat. Remove neck and giblets from body and neck cavities of turkey; discard or refrigerate for another use. 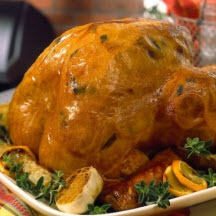 Drain juices from turkey; pat turkey dry with paper towels. Turn wings back to hold neck skin against back of turkey. Untuck legs. Loosen skin over breast and legs of turkey by gently sliding 1 hand under skin. Cut 1 of the remaining lemons and 2 garlic cloves into thin slices. Arrange under turkey skin with half of the oregano bunch. Return legs to tucked position. Cut the remaining lemon into quarters; place in body cavity of turkey. Add remaining 4 cloves of garlic and the remaining half of the oregano bunch. Spoon or brush some of the lemon juice mixture evenly over turkey. Place turkey, breast up, on grill grate over drip pan. Cover grill with lid. Grill 2 1/4 to 2 3/4 hours, or until meat thermometer inserted deep in thigh reaches 180°F (82.2°C), basting with more lemon juice mixture after each hour.